When City ComicFest & Convention of Comic Culture comes to town, it’s Mordecai and Rigby’s perfect chance to meet their favorite action hero extraordinaire: Bulk Berk! It’s time for City ComicFest & Convention of Comic Culture! When the one-and-only comic extravaganza comes to town, Mordecai and Rigby do everything they can to secure tickets for the once in a lifetime opportunity to meet their favorite action hero: Bulk Berk! But what starts as an innocent trip to pitch Bulk Berk and the team on their own original movie soon becomes much more complicated, as Mordecai, Rigby, and the entire gang from the Park get more than they bargained for when Bulk Berk asks them for help getting a super rare item that can only be found at the show. 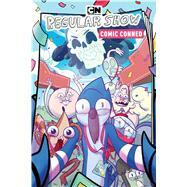 Join writer Nicole Andelfinger (Munchkin, Adventure Time Comics) and illustrator Mattia di Meo (Adventure Time/Regular Show) as Mordecai and Rigby embark on an incredible journey through their local comic convention.